Eighteen units of coursework, a part-time job, a social life of some sort and avoiding a nervous breakdown. Sound familiar? Don’t give up hope. Developer Rodrigo Neri hopes to throw students a tiny life preserver with his free myHomework app. It provides a system for keeping track of your classes, assignments, and due dates, all in one handy package. A Touch of Class: Use the green tab in myHomework to add classes and create a schedule. Then you can use the yellow button to add homework assignments. 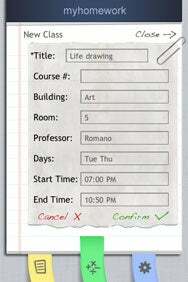 Launching the app shows an attractive “notebook-with-sticky-notes” kind of look, with a straightforward interface. Three colored tabs at the bottom of the app get you going—yellow for homework assignments, green for classes ,and blue for info and preferences. Starting with the Classes tab is a good idea, as things set up here become options for homework later. You put in your class title, room, teacher, days and times; then, tap confirm and your class schedule is ready to go. Over in the Homework tab, adding a new assignment is easy enough, allowing you to input a title, type, due date, and notes, in addition to choosing a class from what you’ve set up previously. A touch on the Options tab allows you to set up notifications, so a badge appears on the app’s home screen icon when an assignment is upcoming or late. There is no option to have the app beep, vibrate, or scream at you when something is really, really overdue and you are ignoring it. Also, there is no sync feature—so don’t expect your homework to show up in iCal anytime soon. myHomework’s interface can be a little buggy at times. Occasionally, I would tap an input field, and it didn’t come up correctly. Any college student or high school kid lucky enough to have an iPhone should find myHomework to be useful. Parents sending their kids off to college might hope that this is just one of a barrage of tools their students use to keep organized during a busy period in their lives. myHomework is compatible with any iPhone or iPod touch running the iPhone 2.2 software update.